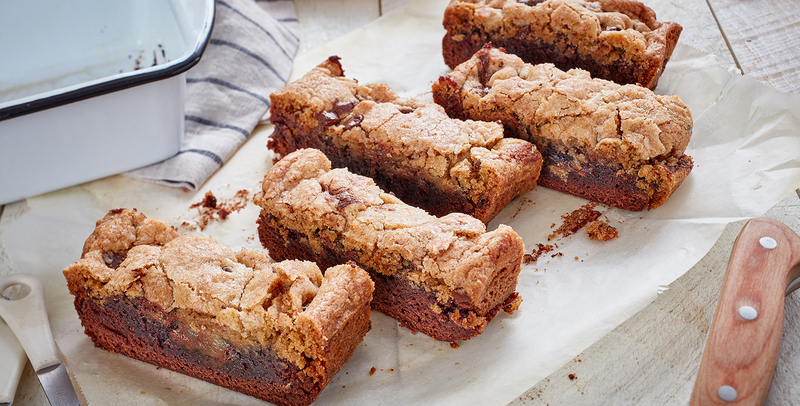 Bake sales are a great way to bake together as a family and share your favourite treats. 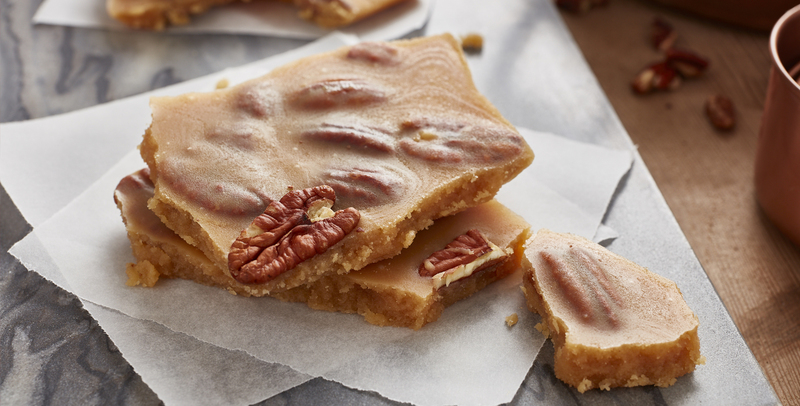 Make yours a sweet success with our bake sale recipes. We’re baking a difference with WE Charity. This year, with the We Bake for Change Campaign, WE and Robin Hood® are helping baking as a family go even further by asking families to hold bake sales to raise funds for WE Charity. The icing on the cake? The funds raised will contribute to positive change, supporting families globally. Together we can bake a difference! Find out how you can rise to the challenge. 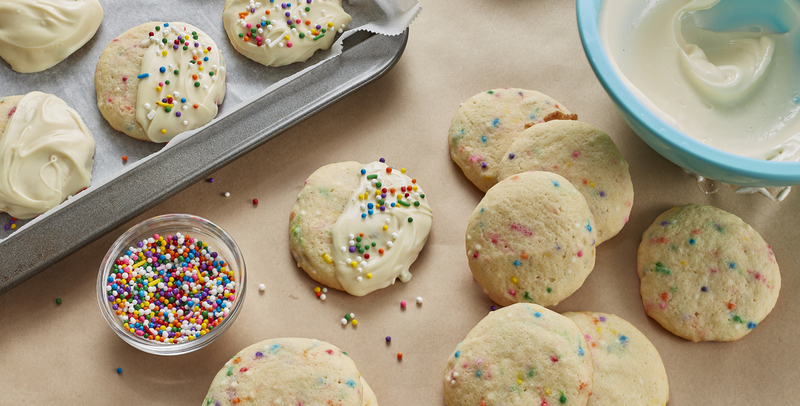 Run your bake sale like a pro with our helpful tools. Get going with our checklist and printable materials. Create custom signs for your sale with our printable templates. A great bake sale takes organization and planning. 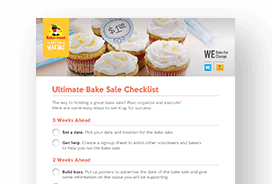 Follow these steps to help make your bake sale a success. 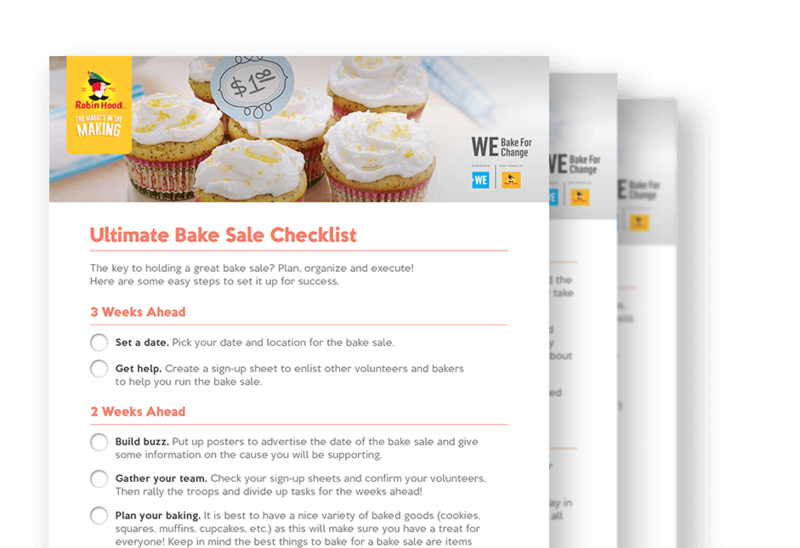 Make it easier for yourself and everyone by enlisting volunteers and bakers for your event. Use a sign-up sheet to track who’s doing what and ensure they fill in their name, contact information and what they will be providing. 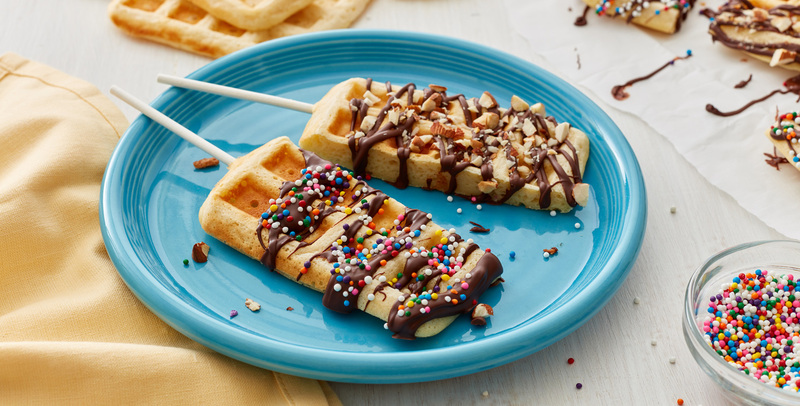 A great bake sale requires a lot more than just baking! Have volunteers sign up for various tasks such as a planning committee, decorating team, accountants, or have them bring extras like coffee, tea, hot chocolate and cold drinks to serve with the baked goods. Make sure everyone providing baking also brings along a sign with the name of their recipe and an ingredient list. There are so many food issues and allergies today that everyone must be aware of what is in each recipe. Hang posters and signs, send email reminders, and announce your sale ahead of time so people are aware you’re holding the bake sale. If you’re baking for a certain cause, consider providing information about the cause and how the bake sale will help, before and on the day of the bake sale. Include information on posters or hand outs to let people know how they are helping. This will help get everyone excited! Don’t know where to start? Use our free printable materials that you can customize for your sale. We have a price list, poster, tags, and table cards to help announce your bake sale and display your items. Bake ahead and freeze any goods you can. Then simply take them out one day ahead and let them reach room temperature. The best items to bake are easily transportable (so no icing) and last a long time out of the fridge. Bake simple, high-yield recipes. 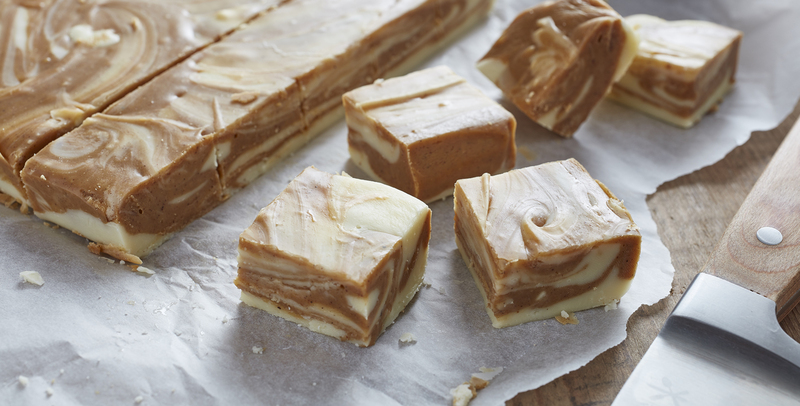 For ideas, see our recipe section here. Be aware of any school or community food guidelines, such as nut-free, gluten-free or other restrictions. Have a table and chairs for your volunteers. Make sure they have trays, platters, plastic utensils, napkins, garbage bags and anything else they need. Goodie bags are a great way to allow people to buy more and bring some with them on the road! Don’t forget the accounting. Ensure you have spare change, a money box or jar, and a calculator on hand to store your money and help you calculate change quickly. Play music and have bake sale ambassadors walking around to attract people to your sale. Think of the extras. Include beverages and extra items to complement your baked goods. Is it winter? Serve coffee or hot chocolate. Hot outside? Sell a nice cold drink or make a play on a lemonade stand and sell lemonade. It all adds to the atmosphere. Think outside the box. To help get people really excited, think of a theme and focus your baking and decorations around that. For example, it could be your team colours or a bake sale with treats from around the world. Display the smaller items (cookies, squares, cupcakes) at the front of the table and the larger items (whole cakes) towards the back of the table so none of the baking is blocked from view. Arrange the items by category (e.g. all the cookies together). Arrange price tags and ingredient lists to make them easy to read and to keep questions to a minimum. And finally, relax, smile and enjoy the day! a pro with our helpful tools. of Canada Corp. or its affiliates. © / TM / MC / ® / MD Smucker Foods of Canada Corp. or its affiliates.